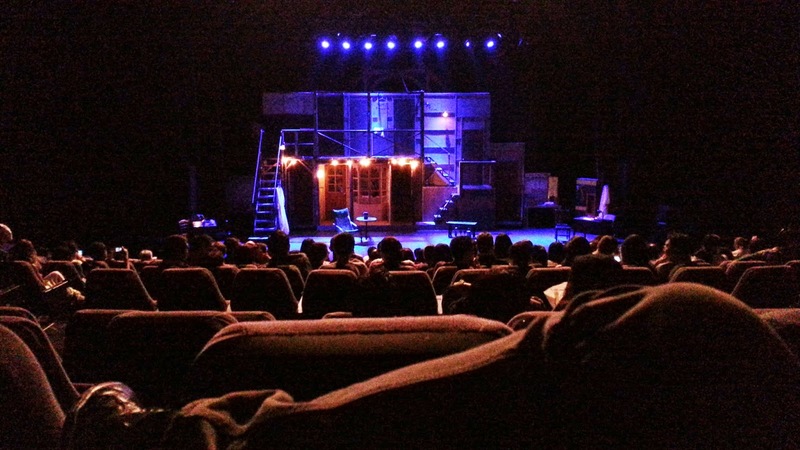 Noises Off, as staged by Repertory Philippines under the direction of Miguel Faustmann, did a wonderful job entertaining me two Fridays ago when, as most of my Fridays go these days, I felt like taking refuge in the shadows of an auditorium. There's just something about the theater that draws me to it, and I could say without a doubt that I do love it because I can brave the evening rush, alone and commuting while the rain pours, just to see a good play. 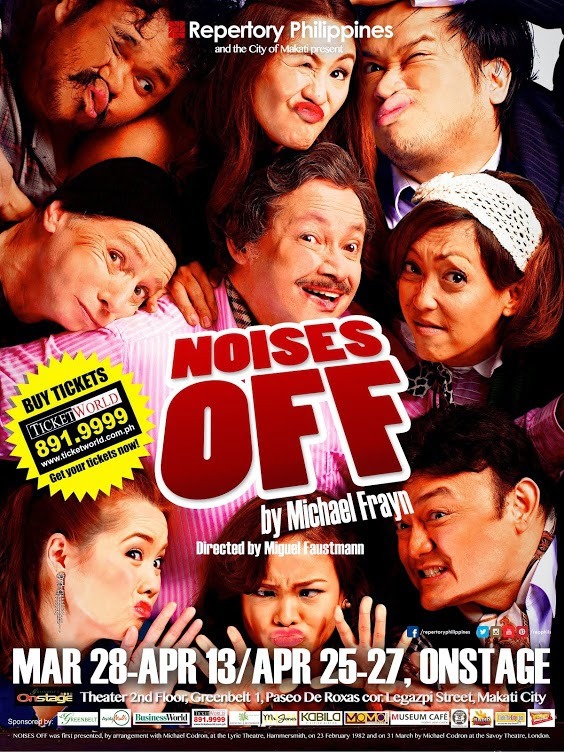 Written in 1982 by English playwright Michael Frayn, Noises Off is a play within a play, a farce, a two-hour long blooper reel, shall we say, for what happens backstage during the fictional theatrical production of Nothing On. One might say it's more a documentary-style reality TV show than a blooper reel, though, because you not only get to see the actors out of character, pulling pranks on each other, forgetting their places or their lines, and laughing at themselves. There's drama involved, but drama that still manages to be hilarious fun. The characters are all so dynamic. My favorites were Dotty Otley who plays Mrs. Clackett, portrayed by Frances Makil Ignacio (probably because she has the first line and she impressed me with the way she delivered her lines from start to finish) and Brooke Ashton who plays Vicki, portrayed by Carla Guevara-Laforteza (because her character was just funny all throughout, and I cannot forget her playing the part of Alice Beineke in Atlantis' production of The Addams Family last year). Theater tickets aren't always as expensive as most people think, and to be honest, even if they were, they're usually worth their price, especially for productions as fantastic as Noises Off. The play only has four remaining shows, from April 25 to 27, at the OnStage Theater, Greenbelt 1, Makati. You can buy tickets via TicketWorld Manila. If you've never been to the theater before (outside of college, of course), Noises Off would be a good first play to watch.